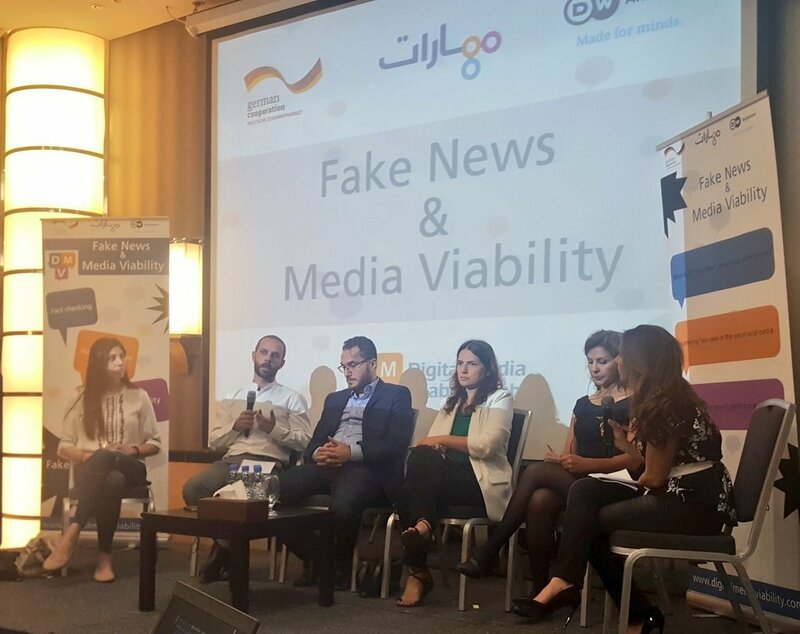 Today the 2nd day of the “Fake News and Media Viability” conference took place discussing fake news and the way in which media is facing them, hosting participants from around the world. This conference organized by Maharat Foundation and Deutsche Welle Akademie was launched yesterday April 24th and continues till the 26th of April, 2018 at Crowne Plaza hotel in Hamra-Beirut. This conference is organized within the framework of the “Digital Media Viability Lab” initiative which aims to provide concrete solutions to the problems media institutions are facing in the digital age, and how to approach viability by supporting innovation to help develop future ready business models that can create and distribute quality content. A session was held entitled “Countering Fake News in the Era of Social Media” based on the fact that many people get their news fix from social media. Social media platforms generally don’t check information before it is published; and social media companies can judge our preferences and feed us exactly the news we want to see despite being fake or real. The session raised two main questions: Does social media have a major role to play in the fight against disinformation? And how can we strengthen the status of serious media in the face of this phenomenon? The session was moderated by Dima Tarhini a senior anchor at DW Arabic in Germany in presence of many researchers and journalists. Dr. Walid El Saqaf, a senior lecturer in Journalism & Media Technology at Södertörn University considered that the data gathered in 2016 is bigger than the data that has ever been gathered, adding that the social media companies aim at gaining profit and do not care for the benefit of citizens. Nadim Kobeissi, a cryptography researcher at the Institut National de Recherche en Informatique et Automatique (INRIA) in Paris, and the founder and director of Symbolic Software in Lebanon/ France saw that fake news go viral faster than the real ones because they tackle the fears of people, while rumors has always been there but nowadays they can reach millions of people very quickly. As for Carole Kerbage, the MENA DATA Desk Editor at Arab Reporters for Investigative Journalism in Lebanon/ Jordan she talked about her experience in this regards; while Madonna Khafaja, the lead program manager in MENA for the International Center for Journalists emphasized that the relation between social media and mainstream media has not yet been on good terms and she talked about their work at ICFG on the program aiming at bridging this gap through a cooperation with Google. A new session entitled “A post-truth world?” was held moderated by Martin Vogle, a program manager at Deutsche Welle Akademie. Since people in power seem to be less and less worried about the consequences of lying to the public, the session raised the following questions: Have we now entered a “post-truth” world where facts don’t matter anymore? What are the implications if such a shift has really taken place? Wael Abdel-Fattah, the founder of Medina in Egypt considered that the post truth world is the one we lived in with the fake news, and thinks that the major sources of fake news are the authorities especially in our region, and said that we cannot talk about fake news in a region where people have no access to information. Rabie Barakat a lecturer of Media Studies Program at AUB, said that fake news have always existed in politics and thought that the post truth world is caused by Trump and Brexit. He added that the post truth world was introduced in our region after the Arab spring. As for Aaron Sharockman the executive director of PolitiFact in USA he tackled the issue of Trump as president of USA and how this caused a major change at the White House and within the whole political deal. Ana Paula Valacco manager of communications and institutional development at CHEQUEADO in Argentina focused on the relation between media, politicians, and the public in Argentina and the extent of political control on the news. The German journalist Hardy Prothmann, the editor in chief of Rheinneckarblog raised the question of “what is the truth?” and the role of trump; he said that trump is definitely funny and active on Twitter and his tweets go unchecked, and here the role of journalists is missing. He stated that the media system in Germany is effective, thus the fake news is not considered as a mojor problem like in other countries. He considered the media system in Germany the strongest in the world, thus fake news cannot be easily widespread because of fact checking. In the context of war, fake news or misinformation can lead to catastrophic consequences, a session was held that discussed the way we can fact-check the accuracy of information in a conflict, and how can we mitigate against the risks in a field where ethics, professional requirements, scoops, and politics are all part of the mix. Participants discussed two main questions: What is the “Truth” in a war? Is bias an inevitable evil? The session was moderated by Layal Bahnam, the program manager at Maharat Foundation. Jean-Marc Mojon the Beirut Bureau Chief of the Agence France Presse talked about the experience of agencies in covering wars and fact checking. He said that they counted on citizen journalist when the war started in Syria, the thing that encouraged the agency to train those people since they don’t have the necessary experience, and they were able to cover very important news, and while using them as sources of information they had to fact check all information provided. He added that they receive around 350 photos a day and 20 videos that all need fact checking and they only publish few of them. Nour Samaha a freelance Lebanese journalist talked about the experience of freelancers, she ensured that it is up to the freelance journalists to enhance their content with facts before sending them to the editors, or they can simply assign someone else in the future to cover the events. She emphasized the difficulties faced by freelance journalists to fact check the information. Dima Nassif the chief of Damascus bureau at Al-Mayadeen talked about the fast spread of formatting during the coverage of the Syrian war and the use of terminologies that was disseminated around other media stations. She considered that the exoerience of Al-Mayadeen withdrew the monopoly of media institutions. Hassan El-Haf the chief of Beirut Bureau at Al-Araby said that there is no truth during the war, and tackled the issue of external funds for institutions and their effect on fact checking. As for Aliya Ibrahim the co-founder of Daraj in Lebanon talked about the experience of independent platforms and ensured that banning journalists from accessing the region at the beginning of the war in Syria forced media institution to lean on citizens to get the information. She also talked about the experience of Daraj that aims at telling the stories from a different point of view in an approach that differ from that of the affiliated institutions through investigation and analysis; she added that they receive European funding but they are independent. The day ended with a networking session where some of the speakers made themselves available in an informal setting to chat and make contacts.